Pokerstars provides the most diverse selection in ring games and tournaments online which is one of the many reasons this poker has been able to grow to phenomenal feats attracting more than 120,000 players daily. The poker room which is home to names like Daniel Negreanu, Joe Hachem and Chris Moneymaker provides players with the ability to qualify for seats to live events as well as play against the pros, compete in various leader boards and a top level VIP rewards program. They have a reputation which is second to none and cater to each player on site. PokerStars is Mac compatible and is available in over a dozen different languages. New players at PokerStarswill be able to receive a top bonus of 100% match up to $600 once you make your first real money deposit. This is only the first of many offers from the poker room and although it’s not as large as other bonuses, you will have no problems clearing it. As part of the Pokerstars program you will also be invited to the VIP player rewards, which offers seven different levels for you to achieve based on comp points and each level providing exclusive freerolls, bonuses and merchandise from the Pokerstars.com online store. As a new player you will also receive entry into the new depositor freerolls which are hosted every couple of hours and invitations to special promotions based on your country of residency. Whether you prefer to play Holdem or Razz you will find every common variation of poker in addition to mixed games at Pokerstars. Currently players can choose from *GAMES* with stakes starting at the $0.02/$0.04 up to $200/$400 NL. With a player base as large as the poker room has been able to achieve you will have no difficulties in finding a game within your bankroll, skill level or variation. The level of competition is significantly different than what most rooms offer. The micro tables present a viewed flop percentage ranging from 46% - 50% with the higher limits dropping as low as 41%. PokerStars takes a 5% rake from each hand up to $5 per pot. The tournament schedule at PokerStars provides just about every format and structure you could ask and you can expect to see more than 1,000 players in a single event. Pokerstars hosts massive guarantees on a daily basis with their biggest event hosted each Sunday and offering a $1,000,000 prize pool. Satellites to land based events are found on a daily basis throughout the year and overall more seats are won to major events like the WSOP with Pokerstars than any other poker room online. Beginners and advanced players will be able to compete in tournament leader boards focused on the level of skill and each one provides cash prizes for the top players on a weekly basis. Tournaments are available in multiple formats such as freezeouts, guarantees, re-buys, shootouts, with the lowest buy-in starting at $1. 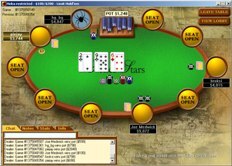 The Pokerstars software is available exclusively for the poker room and is not only very simple to run, but offers advanced features for tournament and sit and go players. It is compatible for both Mac and Windows players and is completely multi-lingual, featuring more than a dozen different languages with an in house support team for each one. Pokerstars also supports a mobile poker app available for iPhone, iPad, and Android. At the time of this review, Pokerstars does not support a real money Windows poker app nor a poker app for Blackberry. The lobby is easy to navigate with each of the games categorized into tabs at the top of the menu and sorted into blind levels for quick access. You will have statistics available such as viewed flop percentage, hands per hour and of course the average pot size in each hand in addition to your hand histories for tournaments and cash games, which can be accessed in the main menu and sent to you via email. The tables can be customized by uploading your own image for both backgrounds and avatars. PokerStars marketing code supports multi-table play with as many as eight games available to play at once, and you can use the quick resizing tools to better fit the windows on your screen. A few additional options for you include tournament dollars, friend finder, game stats available at each table and the software is compatible with Poker Tracker. Overall it’s a top notch program with excellent speed and stability. Support Pokerstars provides an amazing support team and as we mentioned earlier they are available in every language the poker room supports. PokerStars provides two different departments. The first is for general questions or concerns and is only available through email. Response times are fairly decent given the player base and you can expect a reply within 2-4 hours. The second department is for players who are having difficulties depositing to their account. If this is you simply send this support team an email with your home phone number included and a support rep from Pokerstars will call you and assist you over the phone. VISA, MasterCard, Instant Checks / eChecks, ePassporte NETeller, FirePay, CentralCoin, UseMyBank, MoneyBookers, Diners Club, Citadel, cashier's check, money order and ELV (for German Players).